Individual investors have long been cautioned away from trading individual securities. Less than a third of professional stock traders beat benchmarked funds — those whose value follows some large-scale economic indicator. Rather than trying to pick winners and losers, individual investors have chosen to invest while assuming there will be winners. It’s still a good idea. If you don’t have time to research your investments, a whole-market index fund with low fees will provide a safe, predictable return over time. As is always the case with investing, though, some people are prone to looking for a few dollars more. This impulse has led market professionals to tweak the traditional benchmark strategy in favor of a middle ground between actively managed investing and passive index-based investing. This new class of investment vehicles is collectively called “smart beta” investments. Smart beta investments have received a great deal of press coverage lately after one of the founders of the strategy called their value into question. Immediate response to the news was alarmist, as tends to be the case for most stock market news. 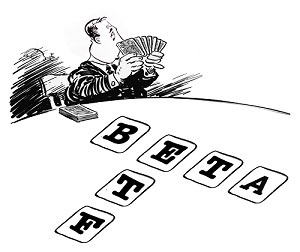 Investors retreated from smart beta investments. Should you reconsider the contents of your portfolio? Before we address the pros and cons of this investment class, let’s take a minute to understand exactly what a “smart beta” strategy is. Typical ETFs follow some underlying index. For example, the Vanguard Total Market Index (VTI) tracks the performance of the entire stock market. If average prices go up, the price of the fund goes up. If average prices go down, so does the price of VTI. A manager, or a computer program, buys and sells stocks to maintain the index at this value. This is the traditional approach. Smart beta ETFs still follow an index, but they tweak it some way in search of better returns. For example, a fund may shift its ownership of food processing companies down somewhat after peak harvest season. The fund designer expects the price of those companies to fall as the cost of their raw materials increases. Doing so may allow this fund to do better than its underlying index, and therefore provide better returns for investors. Rules like this one may seem sensible, but not all smart beta ETFs are so simple. Many employ far more complex rules that target securities that are performing well over the short term or being actively traded at high volumes. Some critics, including strategy founder Rob Arnott, see such rules as enabling consumers to “chase” performance. This chasing leads to speculation, which has only worked so far because of the large number of smart beta ETFs following similar rules. When savvy investors realize the impact of this speculative bubble, many of these funds will be in for a rude awakening. Smart beta ETFs are designed to increase value and transparency for investors while still keeping costs lower than comparable actively managed funds. Some do, and some don’t. Is it worth the risk? Many experts are concerned about the speculative bubble forming among stocks traded by a number of smart beta ETFs. They see the situation playing out like this: One particular stock is performing slightly better than its market peers in some predictive statistic, like volatility. This performance causes smart beta ETFs to purchase it. This purchase drives the price up and encourages other smart beta ETFs to buy the same stock. This circle of purchases continues to inflate the value of the stock until its value exceeds what is predicted by some fundamental statistic, like earnings. This announcement causes value investors and others to sell the stock, driving the price drastically down. These smart beta ETFs are left holding a lot of worthless paper, and their investors are losing money. While such a scenario is far from a certainty, the possibility of a bubble bursting among this class of funds should be in the minds of investors who are considering them. Smart beta ETFs have been gaining in popularity based upon their ability to generate superior returns. Whether those returns are the result of a better strategy or merely a charging herd remains to be seen. Whatever the future of smart beta ETFs, they are riskier investments than traditional ETFs. No matter how sound a set of trading rules seems, they could always be wrong. Being wrong, in this case, means the ETF actually underperforms its underlying index, costing earnings for investors. Examining the prospectus of any investment is a necessary step in investing. That goes double for smart beta ETFs. When developed sensibly and employed shrewdly, smart beta rules can provide investors with better value. They can even employ balancing strategies to shield investors against risk. Income-oriented ETFs can pursue a specific yield rather than a specific price, enabling them to provide consistent, predictable returns for investors. Of course, actively managed funds can provide the same degree of specificity, but smart beta ETFs have two advantages. These funds can provide the customizability and personalization of a managed fund while improving transparency . With an actively managed fund, investors carry some concern that the manager is buying and selling securities to benefit themselves instead of the investors. A smart beta ETF eliminates those concerns by telling investors up front what conditions will trigger buying and selling. Because of the clear rules of a smart beta ETF, managers don’t need to invest a lot of hours. This helps keep the management costs of the ETF down, which in turn means more money for investors. As Arnott put it, “You can use smart beta smartly or you can use smart beta dumbly.” This class of investments, like any other, boils down to individual tolerance for risk. If you can handle the possibility of loss, smart beta might be for you, but you need to carefully consider the rules involved and make sure they make sense on the ground. If you’d rather not take the risk, traditional ETFs may be a better fit.